As with any game, it is important that the player is constantly receiving feedback on their progress and potential risks to that progress. It important however that that feedback is both obvious and unobtrusive. Here, we discuss a couple of design challenges we faced to creating feedback in Gravity Ark. As the supernova is the main motivator to progress in the game as it will kill you if you move too slowly, it important that the player has a good sense where the supernova is. So, we started trying ways to extend what you could see of the supernova beyond the part that kills you. The goal was to have a visual clue that danger was impending and suggest varying degrees to the immediacy of that danger. Luckily the package we were using to create the Supernova made it easy to add what’s called a prominance, and it worked wonderfully. 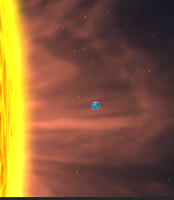 You can see the sun far ahead of where it actually was, and it added a lot of visual flair while providing important information to the player. If you're really close to the supernova the light is red. If you're really far everything becomes blue. Together these help tell the player how much urgency there is to avoiding sudden death by supernova (to be honest though death by supernova is a pretty cool way to go out). Feedback is also important in providing the player with information regarding character control. As such, we wanted the player to have a sense of their speed and direction, so we added a trail to most of our ships. The longer it is the faster you're going. The trail's curve helps the player know what direction you're going in, and how tight of a turn the ship is making. For those interested we're using the Better Trails plugin on the Unity Asset Store.